This memory was not made yesterday, but I do recall all of us running to the grocery store and arriving back home with loads of mozzarella, pepperoni, and several balls of frozen pizza dough. Uncle Jeff made ready the island countertop, wiping it down and assembling the cast of characters. He would act as head chef and his beautiful wife would be the lovely assistant. They called forth the children. They instructed all to thoroughly wash hands and roll up their sleeves in preparation. Little people now surrounded the center island standing on assorted chairs and stools very eager to help in any capacity. I know, not only does this couple cook, but they cook with children. Incredibly brave. 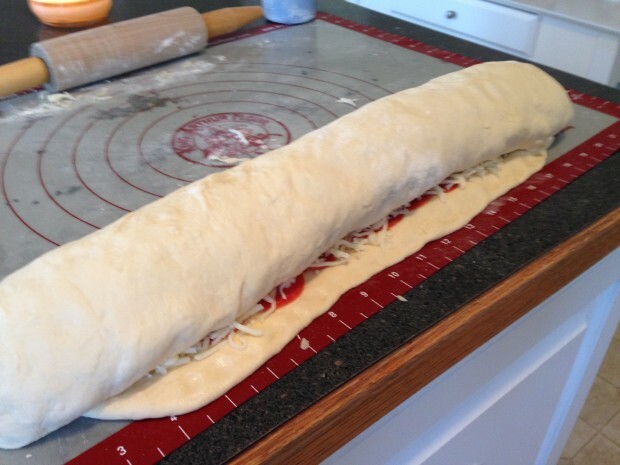 The counter was doused with flour and the dough was stretched, flattened, and rolled. It was ripped and repaired many times over by clumsy little hands. It was expertly tossed in the air and caught again to the sheer delight of the children. Chubby faces and arms were dusted in white when the cloud of activity eventually settled and smiles could be seen all around. This was a blast! They layered it on haphazardly and thick. 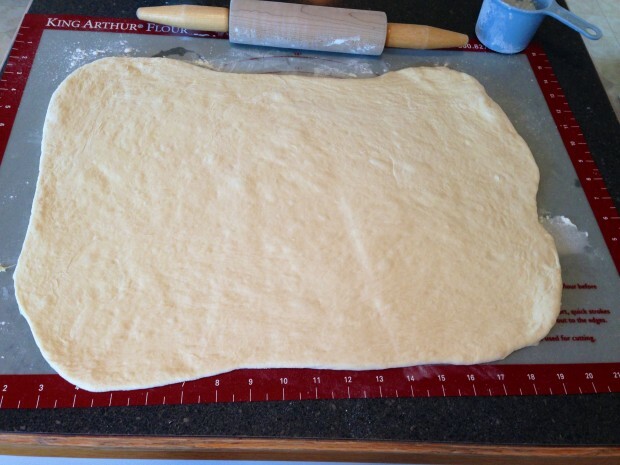 They covered every square inch of pizza dough now laid out before them, not the least bit bashful. Next came the mozzarella. At least 3-4 cups of shredded goodness was messily tossed all about until the pepperoni had completely disappeared. For good measure, they each took a turn giving the grated parmesan cheese a good shake over the entire creation. So this couple…not only are they incredibly brave….but they also know how to have fun in the messy chaos of cooking with young children. Do you feel sick yet? This giant mess needed to be rolled up jelly-roll fashion into a log. The seam was sealed and the impressive wonder was placed seam-side down on a baking sheet, then ushered into a 400 degree oven for 30 minutes. The entire crew created two more master pieces before the fun was over. Then it was clean up and drool-over-the-heavenly-aroma-filling-the-house time. We heated some marinara sauce for dipping and sliced the warm pizza bread just out of the oven for serving. My children inhaled it. They raved about it. They requested it for years. They still request it to this day. And while I have never been close to as much fun, nor anywhere near as entertaining in the pizza-bread-making process, I have managed to make pizza bread. I always make Pizza Bread two loaves at a time. I make my own dough not because I’m an overachiever but really because I’m lazy. It takes more effort to run to the store and buy dough than to throw a few ingredients in my stand mixer. 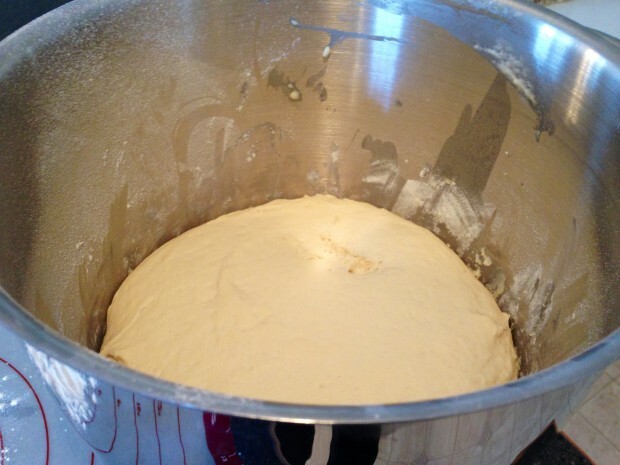 Once the dough is complete, I preheat the oven to 400 F.
I turn the dough out onto a surface dusted with flour and roll the dough around so that it is not overly sticky and easy to work with. 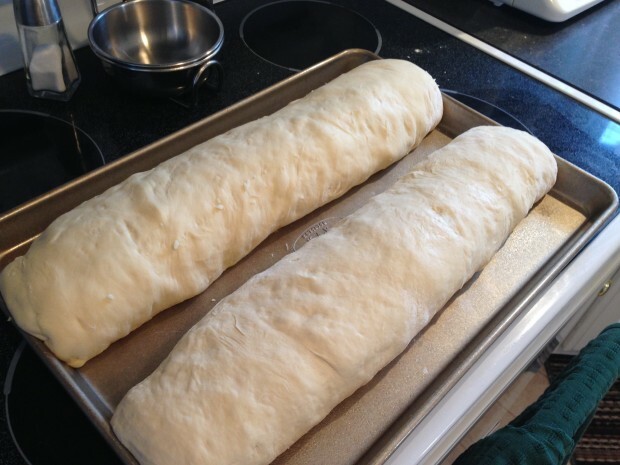 I divide the dough into two equal halves, setting aside one half for later. 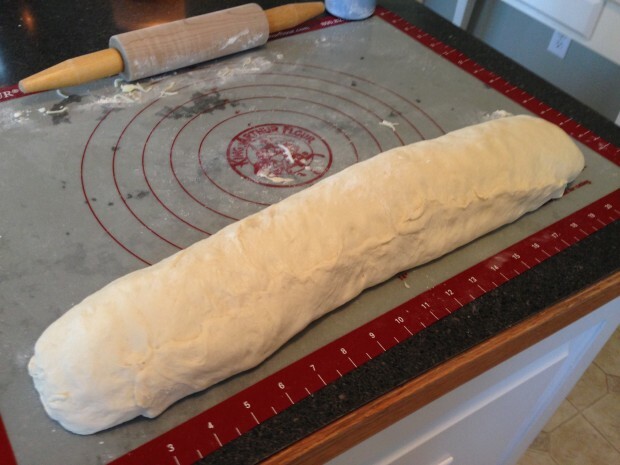 I roll out one ball of dough into a large rectangle, about 14×18. 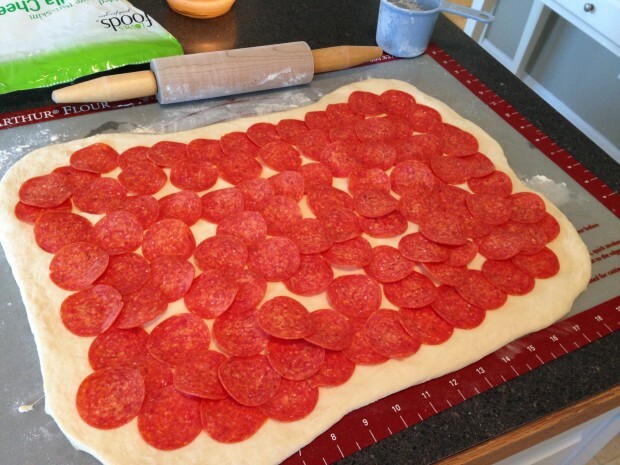 Now it’s time to cover the dough with slices of pepperoni. You might be cringing, but trust me, your children will thank you. 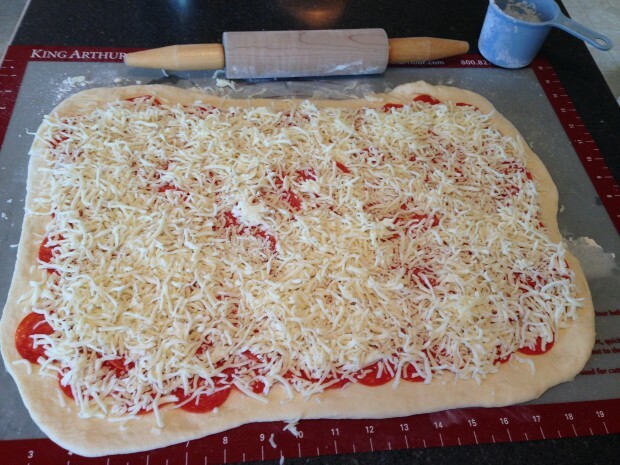 I use about 8 ounces of pepperoni for each pizza bread, or 16 oz total. If pepperoni doesn’t excite you, use pre-cooked sausage, chicken, or ham. One of my favorites is sausage and jalapeño pizza bread. I use precooked sausage and then scatter the jalapeños all across the top before adding the cheese. Oh yeah. Dee-lish. Next it’s time for the Mozzarella. I generally use the shredded variety because that’s what I tend to have on hand. Throw about 3-4 cups on each of your masterpieces. If you’re feeling especially wild and crazy today, you can shake some grated parmesan cheese over the top. It will taste just fine either way. It’s rolling time! Beginning with the longer side, closest to you, start rolling this thing up jelly-roll style. I kinda tuck the ends as I roll so I don’t need to bother sealing them at the end, but whatever works for you. Here comes the tricky part. I must have zoned out when the Egs shared the super-seal instructions because I have issues with my pizza bread exploding mid-bake cycle. Perhaps ‘explode’ is a strong word. Basically cheese leaks out along the seam almost every time I make this. I pinch the seam closed and have tried brushing water along the edge before pressing it together but 8 times out of 10 I have leakage. Perhaps I overfill it? Advice? No biggie though, it still tastes amazing. 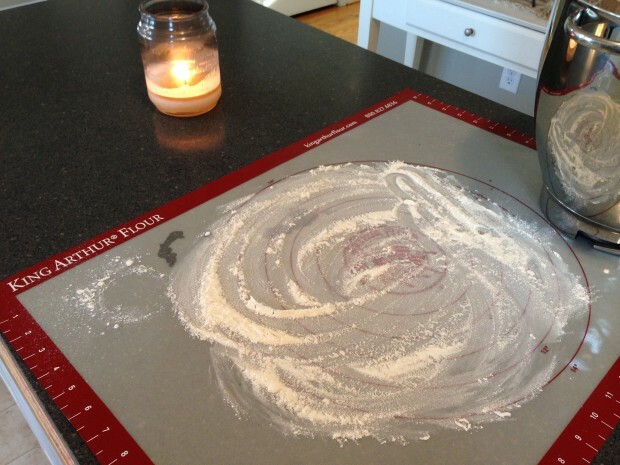 Carefully transfer this bundle onto a jellyroll pan, seam side down. You can grease the pan or not. I’ve never had a problem with sticking. Now it’s time to make roll number 2. Pop your creations into the oven and set the timer for 30 minutes, or until the dough is a nice golden color. I usually let my loaves cool for 10 minutes or so on the baking sheet, before slicing, so the cheese isn’t quite so gooey. Then I transfer to a cutting board and slice it up. You can see below how my seam popped a little. It’s okay. The party will go on. Trust me. Just slice ‘n serve with a side of marinara and all will be right with your world. 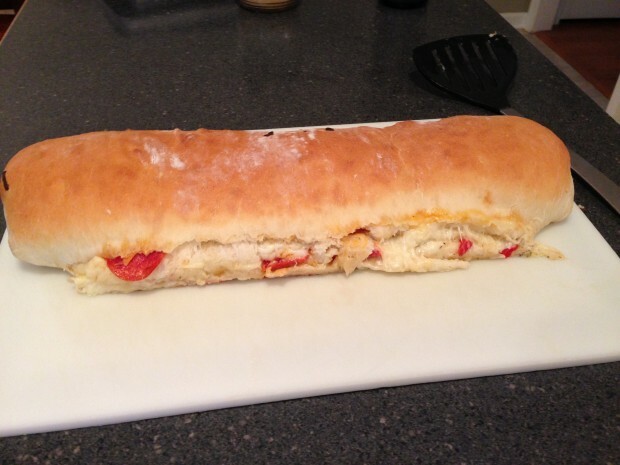 I love to bring pizza bread to any potluck style event. I do it all the time. It is so portable, kid-friendly, and tastes good either hot or cold. Pizza bread is legendary in this house. 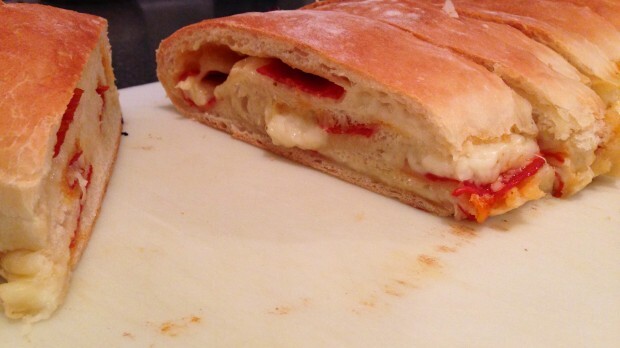 It is not to be confused with stromboli. Because according to Uncle Jeff, there really is a difference. I don’t have enough culinary prowess to debate the issue. You would have to take it up with him, the creator of this recipe. Doesn’t matter what you call it though, it’s delicious! That fun couple sounds so cool. Egcellent in fact. Can I say that our children now request it monthly, if not more. 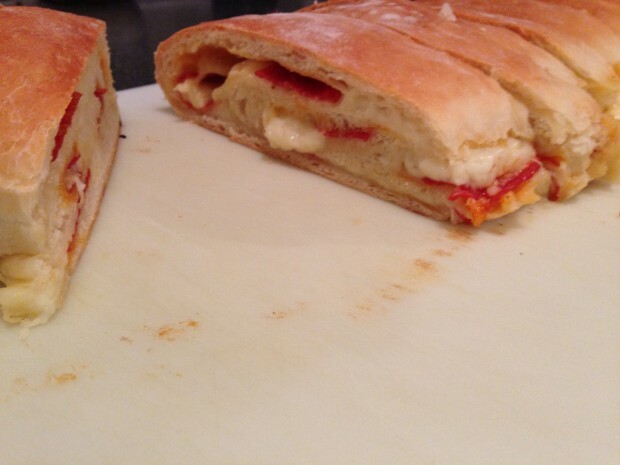 Pizza Bread is now a big hit at our house, thanks to the O’Melias! Tonight will be our second night having this since you posted it. The first time was a huge hit, and I think it will make a regular appearance around here. Glad you shared it! P.S. I’m a friend of Adam and Laura, plus everyone else you know at our church.